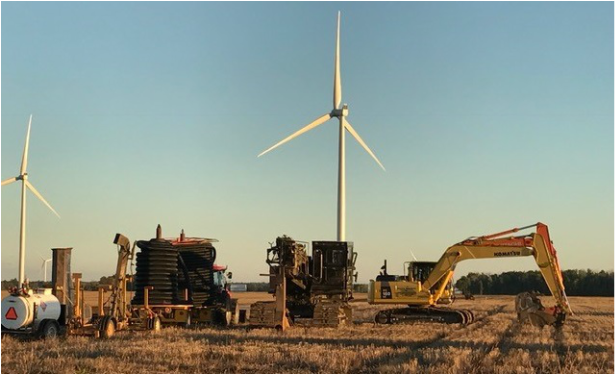 Gillier Drainage provides drainage services for several major wind farms across South Ontario. This includes pre-planning, topographic data collection, tile inspections, installation, reroutes and cable path repair during and after construction of the project. Lastly, we present our clients with a detailed repair catalogue of every site we perform services on. Some clients who have taken advantage of our knowledge and experience in this field are Pattern Energy, Engie Canada Inc, Suncor Energy, and NextEra Energy. Over the last decade, Giller Drainage has perfected the methods and procedures required to perform drainage installation for these projects. Our processess are quick, efficient, and cost-effective. We believe preparation and pre-planning is the key to a fast and productive work flow. If you'd like a quote or more information on our wind farm drainage processes, feel free to send us an e-mail at any time!